Summer is pretty much upon us now and in my eyes it can only mean one thing. It’s time to don those swimsuits and gear up for some frolicking in the pool. There is no better way to relieve the tensions brought on by the blazing summer sun than to drench yourself in your own backyard pool, but not all of us are so lucky as to have this option. Traditional pools are very expensive to build and maintain but I will be suggesting in this article that there are more affordable options in the form of above ground pools that will ultimately yield as much satisfaction and enjoyment as their more expensive counterparts. 5 Do I Need a Permit For My Above Ground Pool? As with pretty much everything in life, the sky’s the limit in terms of what you can pay when searching out the best above ground pools. You can literally spend tens of thousands of bucks customizing the bejesus out of your pool whilst having to spend even more to get all the best pool accessories that the magazines and social media advertisers have pushed onto you. In reality, I see no reason why you should be spending more than a thousand bucks for your summertime fun. This budget will give you a more than big enough pool for you and your family to share and enjoy or will be equally as hospitable for a bunch of your child’s friends to come over and enjoy. Intex are a very well-known name in the swimming pool industry and offer a number of very good options for you to choose from. I would like to lead you to this particular product where you can see the same basic design but in various sizes. I have picked out the 18ft x 48in model as it is the largest option but still comes at an incredibly affordable price. For less than $500 you and your friends and family can enjoy all the benefits of having a large pool all summer long. If you were willing to sacrifice a bit of space however, you will notice that the price decreases dramatically. This might be of benefit to those who are not that into sharing your pool space with others and would like to keep the invitations to in-house only. Whichever size takes your fancy, please take note of what’s included in the package. All these are metal frame above ground pools with super tough laminated walls although the 15ft and 18ft are triple layered. This is to be expected as there is a lot more pressure on those walls due to the amount of water. 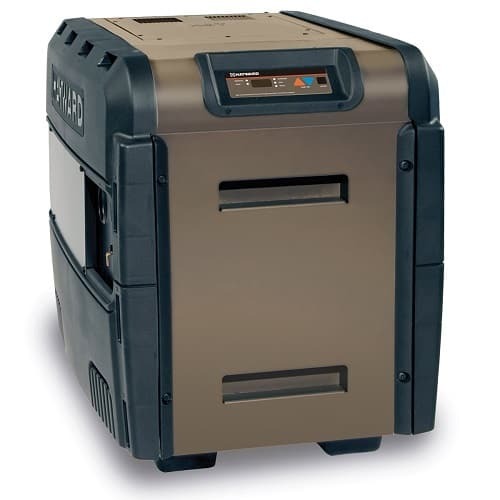 However, there are some models that come with features that the others don’t such as ground cloths, covers and filter pumps so make sure you know what you’re getting and if it makes sense to invest in the extras. I shall talk more on equipment and accessories later on. Bestway probably offer the best small above ground pool for kids with this offering that comes in at just under 10ft in length. It has a rectangular design which makes it a lot more economical if space is an issue in your back yard. It is designed so that it is easy to set up but more importantly, if you want to reclaim your garden space then it is easy to dismantle and store away. It does this by featuring a design that incorporates the use of T connectors and C-clips which makes the whole process a whole lot easier than some of the bigger models that rely on nuts and bolts at times. 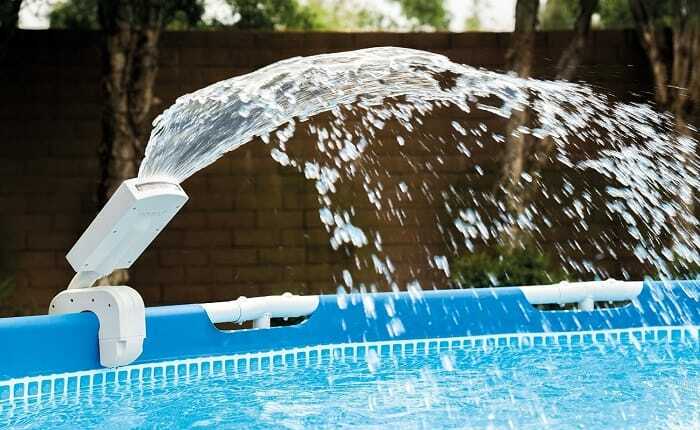 It also comes with a built-in flow control valve which makes filling the pool up and draining it a whole lot simpler. When filled it will offer a depth of 26in which makes it an ideal pool for paddling in or letting young children enjoy their own big-kid pool. We return to Intex for our next best above ground pool for their grown up take on the rectangular pool. 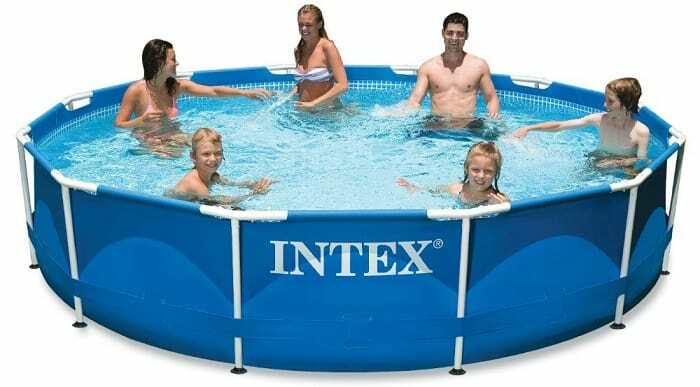 The Intex 24ft x 12ft by 52in Ultra Frame Pool set offers a gargantuan amount of space for a price that will make you wonder why people ever get in-ground pools. This pool has a steel frame but unlike other steel frame pools that might be susceptible to rust and corrosion, it has been powder coated to prevent against such instances. The pool also comes with its own sand filter pump, a ground cloth, a debris cover and a ladder. One of the better features that appears on this pool is the introduction of a dual suction outlet that improves on the single outlet by giving better water hygiene and water clarity. That’s not to say this pool package is all singing and dancing though, there is an option to upgrade to a deluxe maintenance kit which in my eyes seems a bit excessive. You do get a leaf rake, a curved wall brush and a vacuum head but I’m sure unless this is your first purchase you will have similar tools already at your disposal. The above pools are great value for money and offer a semi-permanent solution to your above ground pool needs but what if you want something that is more permanent? This pool from Wilbar probably answers those requirements. It features a super strong steel wall that offers a sturdier feel as opposed to the liner and frames that are used in some of the others. This does make installation a little trickier and of course it does also reflect in the price but if you want a permanent structure that will stand up to all elements then this might be the way to go. The Wilbar is a circular above ground pool that measures 15ft by 52in although you can see that many other sizes are available. To stay within our budget of less than $1000 I chose this option although I’m afraid to say there might be some other expenditure needed. It doesn’t come with a pump or filter system so they will definitely need to be picked up. What it does offer however is a nice big space that offers greater reliability in terms of leakages and degradation that some of the other items could possibly suffer from. We have chosen to show you, in the main, pools which are considered to be semi-permanent or temporary. These pools will typically be made from frames which are made from steel or aluminum which will support a vinyl or PVC liner. Depending on the size of the pool this liner can be many times reinforced to offer greater durability and protection from tears and rips. The metal frames are susceptible to oxidization which can lead to corrosion so if you think this could be a hindrance to your enjoyment you might want to invest in a framework that has either been powder coated or is not liable to suffer from oxidization. Permanent above ground pools are normally constructed using walls and frames of steel, aluminum or resin. They all hold different qualities which you might like to take into consideration before purchasing your pool. For example, steel is extremely durable and heavy, aluminum is lighter which means it can possibly be moved easier but also means it is less sturdy, and resin is the more expensive materials but will not retain heat like its metal counterparts or ever suffer from corrosion. If you read our section of best affordable above ground pools then you will already have noticed that there are a multitude of sizes available for you to choose from. I would say generally though that the largest pools tend to stop at around the 30ft mark although there are always exceptions. Above ground pools generally fall into 3 sections; circular, oval and rectangular. Circular above ground pools are best for generally messing about in. They do take up a lot of room however so always make sure that you have enough space if you want to install one. They do offer a lot more space to swim though, perhaps surprisingly, than their rectangular and oval counterparts. Oval and rectangular above ground pools bring with them great space saving properties. If space is a bit tight in your backyard then you should definitely think along these lines. These pools also offer a better chance to swim laps, if that is your preference, or to set up some fun games such as volleyball or basketball. Choosing the correct location for your above ground pool can save you numerous hours of cleaning or many hundreds of dollars worth of power in the long run. It can also prove essential in terms of safety. The above ground pool should ideally be visible from anywhere on your property. This safeguards against any mishaps or accidents that can occur to users young or old. It should also be on ground that is as flat as possible. Any pool that is on uneven ground will experience a bias in water pressure that can put unwanted pressure on the liner which may cause bowing or rips. On the same basis, the ground should be free of any sharp stones or pebbles. Placing the pool where it can receive plenty of sunlight can prove to be very beneficial. Not only will you have warmer water to enjoy your time in the pool, it can also extend the swimming season for your friends and family without the need of a pool heater. If you have trees or large bushes in your garden then you might want to consider a couple of things. Firstly, it is not ideal to place your above ground pool directly under anything that can shed its leaves. This only leads to more time on the maintenance side whether it be fishing the leaves out with a net or unblocking your filters and pumps. On the other hand, trees and foliage can offer some protection from the elements. Natural windbreaks will help eliminate water evaporation from your pool whilst also maintaining a good temperature. A good rule of thumb is to be around 10ft away from any trees or bushes if space allows it. Do I Need a Permit For My Above Ground Pool? The pools that we have suggested on this page will be alright with no permits however some of the permanent above ground pools may require you to have a permit. In any case it’s better to be safe than sorry, especially when there could be a financial risk so check your local zoning guides and regulations and double check that you are able to install your pool before purchase. 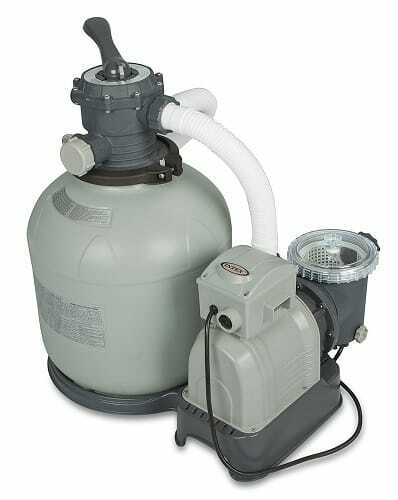 Pumps are absolutely crucial for the health of your water in your above ground pool, it is what pulls the water through the skimmer and filter before returning it. They will often be measured by horsepower so how many of those horses do you need? Well, it’s not so difficult to work out. Generally you can say that anything 24ft in diameter will require a 1 horsepower pump whilst anything over will need a 1.5 horsepower one. Don’t be tricked into thinking bigger is better because in this case it most certainly isn’t. If you apply a 1.5 horsepower pump to an above ground pool that is too small for it then you will be dragging too much water, too quickly through the cycle which will mean the filtration process will not work as efficiently and ultimately affect the health of your pool. When it comes to filters, there are 3 options for you to consider; sand filters, cartridge filters and D.E. filters. These are the most common way of filtering your pool. They work by pushing water through sand which is located inside the filter which eeks out all the impurities. Once the sand filter becomes full you will notice a drop in pressure which indicates it’s time to clean it. This is done by a process of backwashing which should be undertaken every 2-3 weeks. Cartridge filters operate in much the same way as your average tap water filter. There is a large sheet of fine mesh material that the water is passed through which blocks out impurities. These materials can cover a large space so ultimately prove to be more efficient than the sand filters although replacing the cartridges can be more expensive. Diatomaceous Earth filters work by using a series of eight grids coated in D.E. powder to filter your above ground pool water. They are definitely the most expensive of the three types of filter but they do offer the best filtration statistics with it being able to clean down to 5 microns. Everyone loves a good accessory and it’s no different when it comes to your above ground pool. There’s many extras you can buy, some practical, some not so practical but all can enhance what is already a very cool backyard feature. Pool heaters are a great way of getting extra temperature into your pool when the days may be a little gloomier than usual or if you want to extend your swimming season by a month or two at the beginning or end of the summer. You can achieve this in slightly different ways depending on your needs. Natural gas pool heaters offer year round heat for your pool. Ideal if you are not blessed with continual sunshine. They can prove to be expensive and will need to be fitted by an experienced electrician /plumber but once it is up and running you will not have to be worried about a cold pool. Solar powered heaters are basically covers that you can leave on your pool that stop evaporation of your water which in turn maintains and then heats your water temperature. It does this by using a bubble wrap design. I first learnt of the magic of bubble wrap when I saw a gentleman using it to cover his windows. He explained that the bubbles capture the heat more efficiently and transfers it to his house. It’s exactly the same principle when used on pools and as long as you can get a cover to fit your pool entirely, it will provide an environmental and economical way to provide heat for your pool. I have purposely not mentioned anything about chlorine tablets or floaters or any other chemical form of sanitization as we have already covered that in our inflatable hot tubs article but also because I believe that salt water systems are the way forward. Firstly it offers a natural cleansing action when used in conjunction with a pump and filter, secondly it promises to be a non-irritant which can be a problem when using some chemicals in your pool and thirdly it is extremely easy to maintain and run. There are also other bonuses such as non-fading of your pool liner and not having to constantly take your pool pH balance. Too lazy to splash water over yourself? Do you get irritable when someone offers to do it for you and secretly want to kill them? Then this water fountain for above ground pools might be what you’re looking for. There’s nothing fancy about it, and it doesn’t really achieve much more than dunking your head underwater can’t achieve but sometimes that constant splashing on your head can seem so therapeutic. Surprisingly, not all above ground pools come with ladders. Crazy if you ask me but that’s how it is. Investing in a good quality, sturdy ladder is essential for your larger pools. This ladder from Confer Plastics is adjustable from 48-56in in height and comes with extra wide steps. As long as you have a level surface then this ladder is extremely stable and serves its purpose with distinction.